In the past week I’ve had to live through two crushing blows to the public schools that I love and believe in. I am a citizen of Cedar Falls Iowa, and this past Tuesday we had a vote for a school bond to build a new elementary, upgrade the others, and generally make sure that we could provide quality education without overcrowding. The bond garnered 57% positive support; unfortunately these bonds require 60% to pass. Instead, our school district will waste more money on portable classrooms and other band-aid solutions, until such a time as funds come available to build. This was followed in Thursday by the announcement that Iowa governor Terry Branstad vetoed $55 million for K-12 education, as well as funding for our state universities. To fully understand the underhandedness of this move, one must first understand that the school aid funding was set long (100+ days) after legally required at a 1.25% increase over the past year. The only way Democrats agreed to this very low funding increase was in exchange for a one-time allotment of $55 million on top. See the problem here? The republicans got exactly what they wanted, which was to shortchange education. In both instances, the argument against funding usually is made with the label of “fiscal responsibility.” In other words, the crooks in the school district(s) are only going to waste our money anyways, and I can’t afford more taxes, and they should find another solution. Locally, it was even suggested by the “Vote No” ringleader that the district hold a bake sale. A bake sale, to cover $30 million in needs. Of course, I’m fairly certain his kids don’t go to the public schools…and neither do many of our state (R) representatives. I get that they have no interest in funding public education, when a lot of that money will go directly toward proud union members like myself who will inevitably vote against them. What they keep your attention off, however, is how much damage this attitude is doing to our communities in the meantime. Oh, we won’t see it yet, we’ll have to wait for these underserved kids to grow up and be under-performing and problem-causing adults. What I don’t get is why anyone who does want a good community would ever would vote against a bond or for republican representatives. Let me make it very clear. We the people are the government. We elect them to represent us and do what we want. We collectively agree on things that matter like schools, roads, police, etc. We pool our money based on ability to pay (based on income or the cost of our house), and use it to achieve these ends. If you really believe our taxes should always go down and never up, then you don’t actually believe in the value of any of those services I mentioned. It also makes you pretty selfish, in my opinion, as the people without private resources (money for private schools, health care, food, housing) are the ones hurt the most by cutting taxes and spending. I know there must be a balance, and that government is as capable as businesses of being corrupt or inefficient. But I think locally, statewide, and nationally we are living through a grand experiment, and time and again, the cutting of taxes and services is showing to be detrimental in the long run. And I believe that I can trust my local school board to spend money wisely, and if they don’t, I’ll remember at election time. But I won’t support starving our children’s education because I don’t trust “the government.” It’s time for us all to stand up for public education and put our money where our heart is. I am sitting at the American Orff Schulwerk Association national conference, where I am refreshing and learning so much about teaching children and adults. However, as I sit in excellent sessions representing diverse cultures and ideas, I am finding myself considering two terms that are in the public consciousness right now: privilege and appropriation. As a Caucasian in America, I do not fear a random police stop, because I know that the officer involved will likely view me as non-threatening, and treat me accordingly. I’ve never been called a racial slur, or given the impression that I wasn’t welcome somewhere, even in neighborhoods where I was not in the majority. Class has privilege as well, and since I grew up in the middle class, I had access to good schools, student loans, and the connections to get or create job opportunities. So how is this relevant to my teaching? Well, many my students are not afforded these same privileges. Instead, they will succeed on their own merits, often despite discrimination. It is my job to help instill these children with the innate drive, self-confidence, and poise to seize or create opportunities for themselves. Orff Schulwerk creative teaching can be a perfect model for this. Students are expected to take ownership of the creative process, composing, arranging, choreographing, or improvising their own ideas, and bringing these ideas to a performance level. Every day I am asking students to demonstrate independence, creativity, and critical thinking. I am also working to develop their interpersonal communication skills. The fact that this aligns with many standards is nice, but the point is that this is what Orff Schulwerk teachers have been doing all along. I can also address discrimination by identifying it within myself. For example, I discovered awhile ago that I learn male names and faces much more quickly than female names and faces. A friend suggested that maybe this was because I grew up with two brothers, but I think it might be a more prevalent social norm that allows men to network with other men, to the exclusion of women. Identifying this issue in myself does not make it go away. Instead, I have to take extra care to learn womens’ and girls’ names, and to ensure that I am giving them equal opportunities and encouragement in my classes. It also means calling out other teachers or children who might try to bring discrimination into our school. Cultural appropriation is a more difficult issue. The concept is that a dominant society has taken something symbolic, such as music, clothing, or symbols, from a minority or oppressed group. This can happen without permission, and without respecting the original meaning of the material. For example, a white person wearing an American Indian headdress is seen as offensive to many. The difficulty lies in separating respectful and natural cultural sharing from cultural appropriation. Like many busy teachers, I use books and websites to gather some materials for learning about and sharing music from other cultures. I also attend sessions at national and state conferences like AOSA. In each case, the material I am learning to take back to my students is at best second-hand, and often even more removed from the source. So the question of whether it is appropriating or sharing is not something I can definitively answer. I try my best to be respectful, to explain to the children the limitations of my knowledge, and to research the music I am teaching. If and when I discover that something is considered inappropriate, I stop using it. Here is an unrelated example. I attend the Unitarian Universalist church, where we celebrate Hallowe’en/All Saints/All Souls Day with a “Day of the Dead” theme, which is borrowed from Mexican culture. I recently saw a blog post shared by a friend, written by a Hispanic woman who was upset with the appropriation of Day of the Dead by white Americans. Now, I’m not in a position to change this single-handedly in my church, and I definitely think it deserves more careful study, as it is possible that this opinion is not the primary opinion of Mexicans or Mexican-Americans. I also see the value of cultural cross-pollination, which is responsible for all of the musical styles and cultures and religions we see today. So I don’t have an answer, but I do have a big question that I hold in my head and heart as I teach a multicultural curriculum. I believe children learn about the world through studying and understanding other cultures, as well as their own. I’m not willing to give that up. It’s just frustrating that what is intended as respect can sometimes come across as the exact opposite. I constantly hear teachers, administrators, and media folks talk about needing to integrate technology into our teaching. I also hear education advocates and parents bemoaning current trends in education. I am a huge tech geek, but I wonder if anyone is truly looking forward to what this will all look like in 25-50 years. Students can learn at an individualized pace. No more “teaching to the middle,” with students left out on both ends of the spectrum. Students can take breaks as needed to get up, play, and move around. No more sitting still while the teacher is trying to talk. Instruction can be tailored to individual interests and learning styles. A student who demonstrates interest in dinosaurs can do math word problems with dinosaurs. Even more, we can break out of the morass of over-teaching math and reading at the detriment of the sciences and social studies. Now, everything can be cross-curricular in nature. Students may potentially spend even more time still and passive, due to the lure of the digital screen. Students may potentially fail to learn how to socialize with other human beings, since their primary interactions will be with a computer. Many educators will become unemployed due to efficiencies of computer-led classes. Because of this, the teachers unions will fight disruptive technology to the bitter end. Some subjects that do not lend themselves well to individual instruction may potentially be eliminated or weakened. Music, for example, is a social activity, that developed primarily as a means for us to communicate and share with each other. The joy and social learning of playing or singing in ensemble cannot be replicated on a digital device. As you can see, there are huge advantages and disadvantages to the upcoming disruptive technology. What I’m trying to make clear with this post is that, given the progress of technology in other sectors, this will happen to K-12 education. It’s not a matter of if, just when. As a teacher who supports my family by drawing a paycheck, this terrifies me. But being scared of it isn’t going to make it go away. Neither is fighting it. Instead, we need to tailor our offerings and instruction, and advocate for the things that humans do better than computers. I believe that dancing, singing, playing, and acting are social interactions, and children will always need to have time to gather and make music. As digital “interactive” music activities rise (they already exist), we need to advocate instead for the live interaction of musicians and dancers. Physical education teachers and advocates will be our allies in this process, as they also have a clear mandate to continue and increase childhood physical activity. Together with free play time (recess), we can become the social, interactive break for students who are working with computers for much of the day. We could potentially even have more time for music, dance, and physical activity, since students will be learning at an individualized pace! The trickle will happen from the top down, since older students can of course be more independent with technology. Our university system is already sagging under the weight of digital competition (and bloated administrative costs). Alternative high schools offer quite a bit of online coursework. How far down it goes is open for debate, as there are certainly social aspects (besides the arts) of elementary school that need to be taught by humans, and there could be unanticipated consequences of too much screen time for young children. But it will be disruptive, and our schools will change, for better and worse. Our job, all of us, is to make it better. Well, I finally finished my book on Aligning Your Creative Sequence to the Core Music Standards, as well as editing my father’s book on Recorder. I haven’t blogged in quite a while, and have also neglected the fledgling Crowd-Sourced Music Standards Facebook group, as it was impossible to separate sharing from writing. Now that it’s complete, I hope to contribute more to that group and here on the blog. Today, I was interviewed for an upcoming article in Teaching Music magazine about the new Core Standards. I won’t give away the article, but it was a fun experience, although I didn’t have all the answers the author was looking for. Last week, I presented a short session for the Iowa Choral Directors Association elementary group on the new Core Standards. This was a good chance to verbalize what I’ve been writing about. I have also been putting the new standards into practice with my new Google Drive template, which I’m using for my lessons at school. The Core Standards are here for a while. I continue to be less than impressed with the new Core Standards, but I don’t think that they will be changed anytime soon. It will take years of complaints and confusion. In the meantime, we should be advocates for common sense standards at the state and local level; be proactive and say what we believe should be the standard, rather than be reactive and have the standards given to us. The Core Standards are not completely terrible. By writing the book, and forcing the standards onto my own teaching, I discovered that there are things I can learn about and places I can grow as a teacher. It’s quite possible that some of my current experiments (such as using concise worksheets to let students express their personal thoughts and understanding of concepts) will not stand the test of time for my classroom. I may decide that, as I’ve said all along, performance and creative skills are so important that anything that takes away from performing or creating isn’t worth my time. But it’s also possible that my students may become better performers by being forced to process the music in a new way. Again, as we look at state and local standards, let’s not dismiss the new ideas completely, but put them in their proper context. Balance is still key, and the standards aren’t balanced. The standards read in such a way as to imply student selection of repertoire is as important (or more important, since it is listed first) as being able to analyze the music and perform. They don’t highlight the fact that making music is the whole point of music, and everything else revolves around that. I have more ideas flowing, but on different topics, so I’m going to end this post here and start a new one! It has been two weeks since the National Coalition for Core Arts Standards launched the new National Core Arts Standards. In that time, I’ve been reading, writing, and discussing the standards as much as possible. I started a FaceBook group called Crowd-Sourced Music Standards, which will look at open suggestions for both revising and supplementing the core standards. The hope is that by having an open forum, the best ideas can rise to the top, and perhaps this can be used in the future by our professional organizations. In that group, we have already had some great discussions on the differences between standards and curriculum, some frustrations with the new standards, and some insights into their development. Today, I was fortunate to assist with an Iowa Department of Education forum on the new core standards, which featured Lynn Tuttle, the Director of Arts Education for the Arizona Department of Education, as our keynote speaker. As President of the State Education Agency Directors of Arts Education (SEADAE), Lynn was tasked with coordinating the work of NCCAS through the writing process. I was excited to get a positive spin on what I had unfortunately felt very negatively about up until this point. Lynn gave a great overview of the writing process, and the reason that Process is the focus of the new standards. She explained the structure, and how to navigate the standards very well. She accepted open questions about new things that surprised people (most of the attendees were seeing the standards for the first time today). One person questioned the new concept of the “Select” strand, and we talked about what that could look like (students possibly selecting from a teacher-selected list or previous class repertoire, for example). Another asked about the lack of content (elements of music) and skills (singing, playing) in the document. Both Lynn and our state IMEA/NAfME leaders confirmed that the plan is for NAfME to roll out a companion document in the near future (possibly this summer) with some of this material. I did express my ongoing concerns about balance, and for the sake of clarity, I will attempt one more time to put down my ideas here. 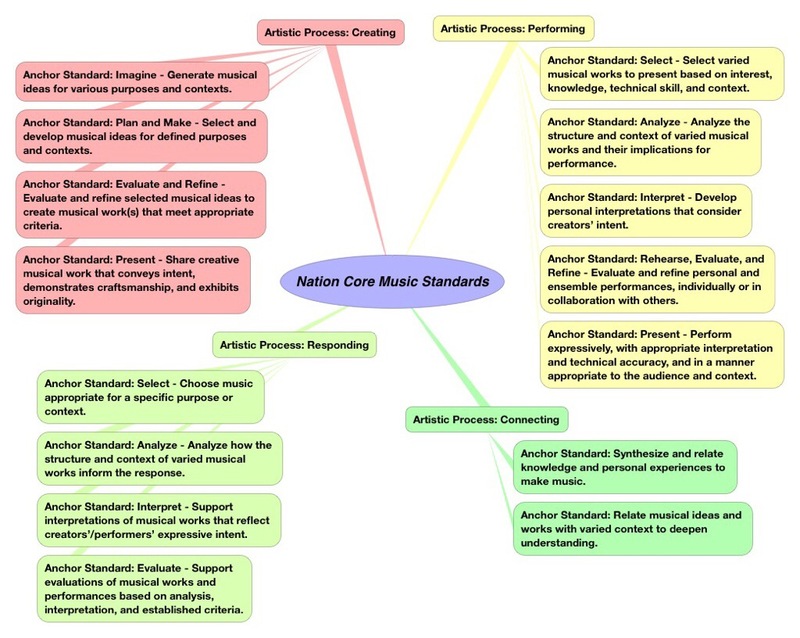 Defining Standards – NCCAS and NAfME have chosen to define standards in a way that excludes skills and concepts. Yet according to both the 1994 Arts standards and the Common Core ELA/Math standards, skills and concepts can and should be a part of the standards. I get the argument that we don’t want to tell teachers how to teach, and even that agreeing on what to teach in each grade level is difficult. But I don’t think this means we have to say “that’s not part of standards,” when that doesn’t jive with how the rest of the educational field is using the term. As NAfME presents this companion document of skills and concepts, I am curious how it will be perceived, as part of the national standards, or as a less-important footnote. Obviously it doesn’t work like that, as each task is interwoven with others. But I know that the most elemental way that music makes us human is when we are actively creating or performing. If I fail at everything else, and students leave my classroom not knowing why music is important, but knowing how it impacts their life directly, through singing, playing, dancing, etc., I’m OK with that. If I can also get them to reflect, connect, and speak intelligently about music, great. But that would be shallow and disconnected without a huge amount of active music making first. Clarity – Clarity of purpose and direction has, in my opinion, completely failed here. Many are asking why we revised in the first place (and a common answer is, “because other subjects were doing it too!”) We don’t understand why singing and playing instruments could not have been referenced in the performing standards. We don’t understand why the aligned language between arts and across disciplines has to supplant sometimes perfectly good musical language that we value (e.g., plan and make vs. improvise and compose). At the state and district level, we don’t know whether to align with these new standards, our existing state standards (which in Iowa look like the 1994 standards), 21st Century Skills, or all of the above. The one positive I left with today was this. 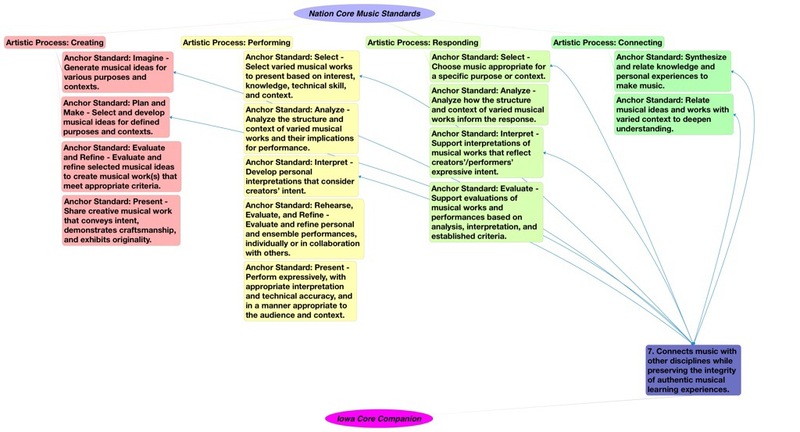 As a career, experienced teacher, the new core music standards will certainly challenge and stretch my teaching. If that is their goal, to take us all to a new level, then mission accomplished. I’m just worried that newer teachers will not have the steps they need along the way. We had a lot of discussion today also about how teacher education courses in our universities were not exposing students to scope & sequence type curriculum development. I suppose that makes curricula and curriculum developing materials like my book even more vital than they used to be! It’s not that I want the national standards to turn us into scripted teachers, but I want them to point the way to the best practices, and for me, I am left wanting. Sorry for the long-windedness! This will be my last blog post about the core standards (unless something changes). I will be active in the FaceBook group I mentioned above, and plan to soon be offering two new titles in the Creative Sequence series, including one that will discuss strategies for aligning your curriculum with these new standards!!! 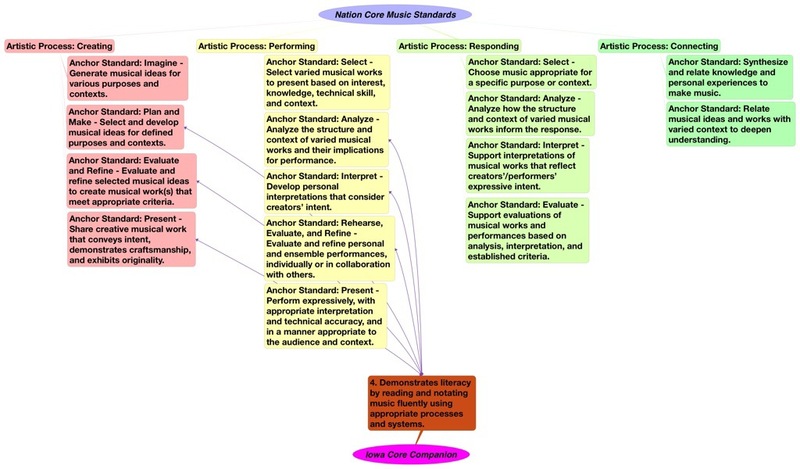 Below are the slides and images used in a presentation on Iowa Core Companion fine arts standards and the new National Core Arts Standards in Des Moines on June 18, 2014. 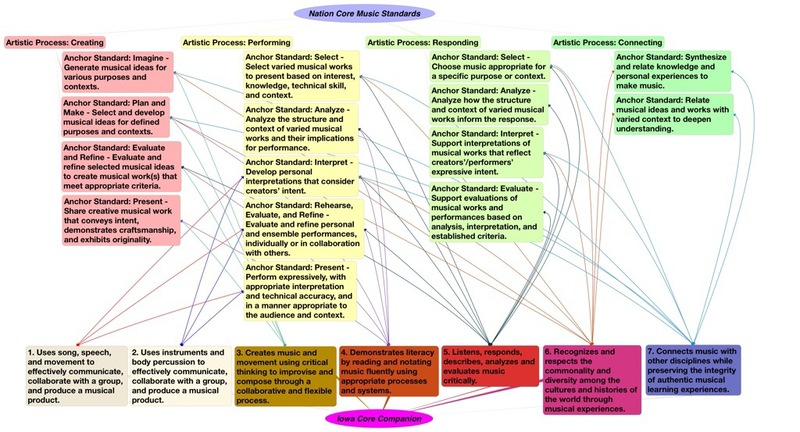 On Wednesday, the National Coalition for Core Arts Standards released the final version of the National Core Arts Standards, a re-envisioning of the 1994 National Standards for Arts Education. Their website is interactive and customizable, so you can definitely find what you want. 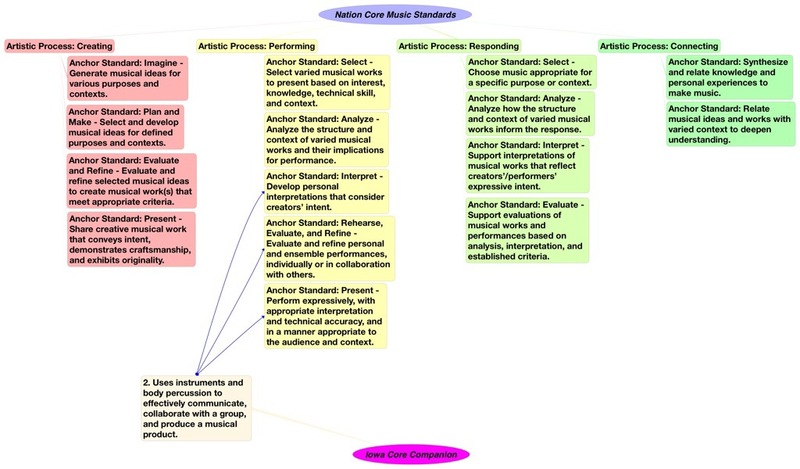 A concise music-only version can be found at nafme.org/standards. Over the past year of the drafts and review process, I’ve been probably the most vocal critic of the new music standards. As an Orff Schulwerk teacher, I love the focus on Process: Creating, Performing, and Responding. Yet also as an OS, I am bothered by the removal of content and skills, and the extensive focus on student discussion or writing (using verbs like reflect, explain, and describe in nearly all the standards by upper elementary). I absolutely agree that students should be able to verbalize their knowledge. Yet I think the standard-writers were not looking at these through the eyes of a brand new teacher. Such a teacher will teach to these activities, and skip over specific knowledge or skills that aren’t needed for that particular project. I think this is backwards, and the content and skills should be at the foremost of the teacher’s planning, with understanding and discussion based on learned material. If you want more on my concerns, feel free to browse through previous posts! So, despite objections, the new standards are here. What now? As a teacher and state/national advocate, I see several possibilities moving forward. Adopt the Standards – Incorporate the new standards into my lessons and curriculum. Promote them at the state level and help other teachers find balance within what I see as an unbalanced guidebook. Ignore/Reject the Standards – Continue using the 1994 standards, my state standards, and the curriculum that I have been developing for my entire career. Advocate against state adoption and alignment with the new standards. Work to Change the Standards – By studying, writing about, and piloting the new standards, I can try to gain an in-depth understanding. By advocating against the standards as currently presented, I can try to create pressure for change, as well as open dialogue with those who are advocating for the new standards, to improve communication. Obviously, I’m going for route number three. I cannot wholeheartedly endorse these new standards, yet I can’t fight against them unless I can demonstrate that I understand them and have experienced them fully. I encourage you to join me. Talk to your principal or supervisor about doing a dual-alignment with the new and previous existing standards in your lessons. Write to your DOE or state legislators, asking that the state review but NOT simply adopt the new standards. Write to NAfME leadership or on the NAfME online forums to express concerns. Write a blog post and share it on Twitter. Let’s create a new hashtag: #musicnotdiscussion. As with anything in this life, it’s those who speak up that make a difference! And feel free to share here in the comments about your advocacy or other ideas. The new National Core Arts Standards were released yesterday, first with a two-hour webinar, and later in the day with an interactive website that can be customized for reading in various formats. 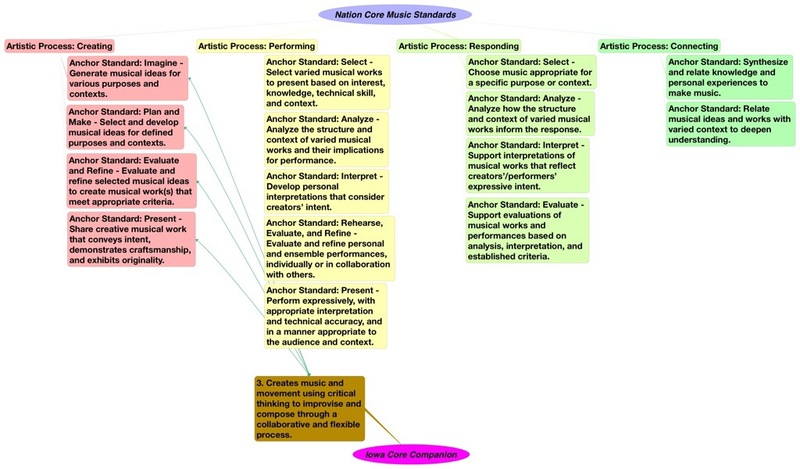 These processes were chosen as a common-language starting point for teaching the arts. According to some of the guest speakers in the webinar today, part of the thinking behind this approach is that by collaborating across arts subjects and classes, we can achieve objectives in different ways or at different times. In other words, if the art teacher in my building were to tackle a selecting task in fourth grade, then that might free me up to focus on something else. This is my personal take on what was being said, so take it with a grain of salt. It was also implied by several speakers that the standards are just a guide, and that you certainly don’t have to teach all of them. While I understand that national standards have always been voluntary, it baffles me to think that this much effort was put into something so detailed and specific, only to say “pick and choose” from the menu! If that’s how we are to see the standards, why have them in the first place?! Elements of Music are referenced in the document – Amazingly, there was little to no reference in the final draft four months ago. Instead, these elements were completely relegated to a separate page of skills and knowledge. However, this was only a partial fix, as I will mention later. Some discussion/explanation language removed from lower grades – Again, this is not a slam-dunk, but there does seem to be a minor shift away from (totally developmentally inappropriate) discussion in the lower grades. 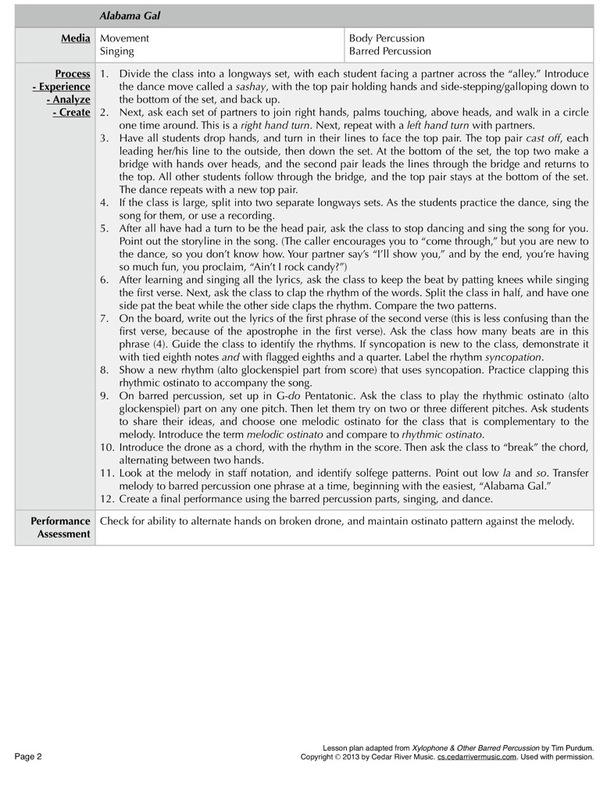 The Performance:Select standard includes room for more teacher direction – The original wording of this standard implied that students would simply choose their favorite pieces, and then perform them in class. The newer wording leaves open the possibility that the teacher can provide a range of repertoire, which the students then discuss and express their preferences about. Now, on to the problems. Despite the fact that the process is “done,” I still see many problems in this document. In this post, I’m not going to be able to list them all, so I will focus on my big problems. Balance – Since these new standards were envisioned across the arts, and were intending to be all-encompassing, they lack balance. There is too much emphasis placed on thought-process, discussion, explaining, connecting to personal experiences, reflecting, etc. In order to achieve all that higher-level thinking, my class either needs to be every day or I need to accept a huge cut in actual performance-skill development. In fifth grade, there are nine standards (out of eleven) that ask students to explain their work or thought processes. That doesn’t count other standards that ask for demonstration or documentation (more broad terms that can include musical performance and notation). Sorry, but I don’t think ending every step of every activity with a chance for every student to speak or write is a productive use of time. I could see doing reflection writings 3-6 times per year, but that’s plenty! And classroom discussion is always a mess when it comes to actually getting good input from each student. There are methods, but they are all time-consuming, so again, I’m not doing this every week or two. My students need that time for skill development. Focus – While they did include passing mentions of elements like rhythm, melody, harmony, form, as well as expressive elements, they never really tell you when to teach them. I know we want flexibility, that’s why we used to have grade bands (K-4, 5-8). 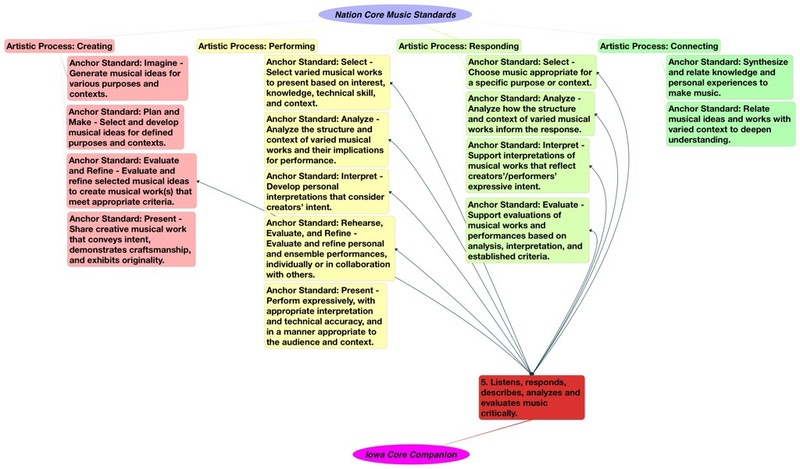 But the actual achievement level for performance, composition, and music literacy should be mentioned in the core document. They ALSO still have not mentioned media (singing, playing instruments, body percussion, speech) at all in the document. Which means that it is perfectly possible to achieve all these standards with only one medium, such as singing. I think this is a mistake. Students learn differently through instrumental music than vocal music. It creates concrete connections to scales and pitches. Nor would I like to see a totally instrumental program, where students don’t learn the most fundamental instrument given to them at birth. Weird Stuff – This goes along with the discussion problems. 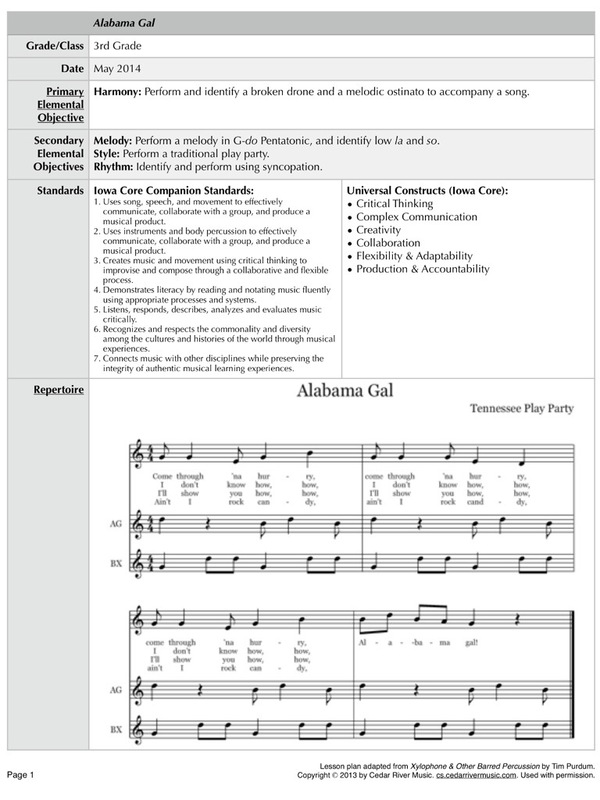 Several of the standards in each grade ask students to connect musical choices to a specific purpose, expressive intent, or personal interests. I get that adult musicians think about intent and expression when performing/composing. But I can NOT think of a valid way for an elementary-aged child to explain their purpose behind a short improvisation, for example. Most of the time, they are playing with a given set of elemental parameters (meter, pitch set, phrase length), and only a handful of advanced students will create something “with intent.” We DO set an intent, such as improvising a B section to a lullaby, staying in the soft, rocking mood. But this is set for the class as a whole, so each student can work together. Again, I do see where this is possible. You could assign small groups or individuals to improvise complete performances, and then have them discuss their choices. The problem is that this assumes a very high level of independence and competence in performance skills and knowledge. In most of my classes, the students need more framework given to them, especially for improvisation. Every time in the past that I have experienced new standards or a new curriculum, I could look at it and say, “I already do all that. 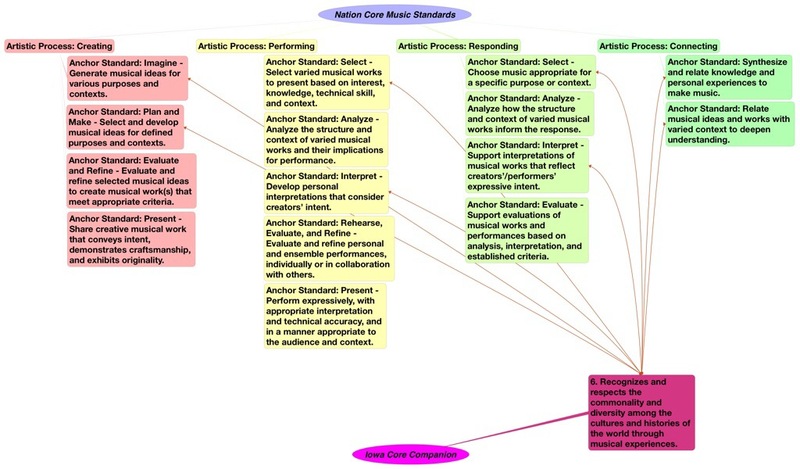 I just need to align.” The new National Core General Music Standards are different. I do not currently teach with high levels of discussion, reflection, and student-selection. I do teach nearly every child to sing on pitch, play and create melodic and rhythmic ideas, read basic notation, and perform as part of an ensemble. I also teach creative movement and folk dance, as an integrated part of our music curriculum. As a sixteen-year veteran teacher with over 25 grad credits in music education, a National Board Certified specialist in Early/Middle Childhood Music, an AOSA-approved Orff Schulwerk instructor for other teachers, and a member of the Iowa Core Companion General Music writing team, I am suprised, stressed, yet up to the challenge to see if these new ideas are something that would benefit my students. Yet I still wonder, as a whole, if these standards will create classes of “music” with one instrument/voice, limited skill development, lengthy discussions, and limited knowledge of musical styles and cultures outside of the students’ own limited preferences. That worries me a lot. Discussion, reflection, and making music in class. The final version of the new National Core Arts Standards are due out in June. While I am cautiously optimistic that these will be a helpful, balanced tool to teach music and the other arts, I have some grave concerns, as mentioned in previous posts. While all of these verbs are used, the vast quantity of standards include the term explain. Explain can mean either a written document or a verbal discussion. Describe and Evaluate are likewise ambiguous. Discuss obviously refers to verbal communication, while Document is clearly written (and not always with words, this could include notation). To give you a sense of how prevalent these terms are in the document, look at fifth grade. Out of 26 standards, 20 include one of these discussion/writing verbs. Now, granted, the last six “Connecting” standards are actually verbatim repeats of earlier standards, but when taking these out of consideration, the ratio is 15/20, not a lot better. So what does “explain” look like in the classroom? Here are some possible scenarios. The number of minutes after each example is my personal estimate of how long this would take to do well. Keep in mind, to be a documented assessment, every child in the room must participate! Large group discussion – Take the time to hear what each child thinks on a subject. This would be time-consuming and repetitive, as many children would just copy what they hear from those before them. 15-20 min. per activity. Small group discussion – Split the class into small groups of 3-6 and ask them to discuss a topic. Put one child in charge of making sure that everyone takes a turn speaking. Ask the group to report back on discussion to the class as a whole. While this may seem more efficient, and is certainly a better learning model, the teacher would be unable to effectively assess each child’s input, and the process would actually take longer than discussing with the full class, by the time each group establishes their routine, and decides what to share with the class as a whole. 20-30 min. One on one discussion – Establish a class activity that students can do independently (such as a small group or individual game, playing quiet instruments, writing, stations, etc.). Take one child at a time away from the activity and ask questions to establish understanding. 25-40 min. Written reflection – Pass out paper and pencils (and a hard writing surface if you have a flexible space with no desks like mine). Either pre-print questions on the papers or write questions on the board. Give students adequate time to think and write. 10-25 min. Let’s take a low average and say it takes about 15 minutes to do each assessment. By the time you set up the questions, establish groups, stations, or pass out papers, it will normally be much more. Now remember that the standards ask for at least 15 such activities during the 5th grade year. That averages to about one discussion/writing every 2-3 weeks, or one every twelve school days. If you see your students 1-2 times per week, that means every 2-3 class periods you will be doing a discussion or written assessment that takes around half your period! Of course each teacher’s schedule will vary, but this could easily end up becoming 20-50% of your teaching time with that class. I don’t have a problem with discussion and written reflection. I think they are valuable tools for learning. I also know that it is something I need to personally work to develop as a habit with my students. However, I think this should take more like 5-10% of my time with students. I want the vast majority of time (say 60-70%) spent making music: singing, playing, dancing, improvising, etc. I want another large chunk devoted to composing, notating, and reading (maybe 20%). Then I need time (10%) to teach a little history and culture, exposing my children to music that they cannot perform themselves. While I understand that the standards/assessments are designed to be integrated, and not separate from these activities, the reality of that much time spent discussing and writing makes me fear that performance and creative skills (i.e., music skills) will suffer. 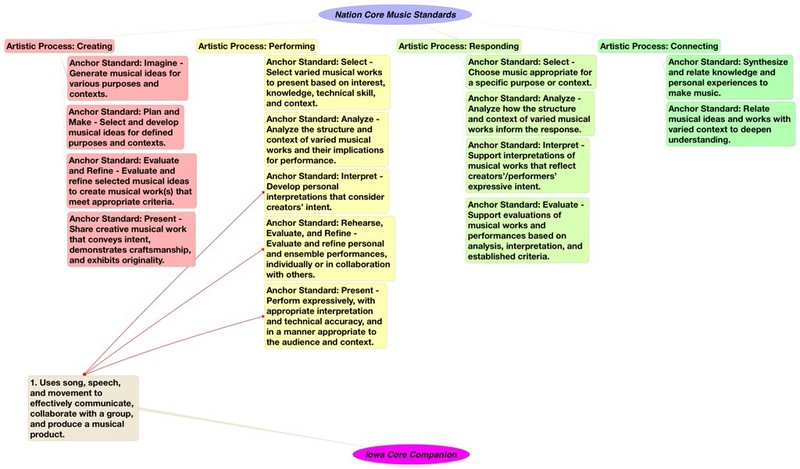 I’m hoping the final version of the standards is more balanced towards making music! If you have suggestions on how you would implement these discussions/reflections in a more time-efficient manner, please share them in the comments!